Where Have All the Pictures Gone? I deleted them yesterday evening, after finding one of the photos from 1968 that Corky had loaned to me for the book, posted on another website. It was part of a focus on Portland on a national real estate website, where somebody (I could not find the person identified), used pictures from elsewhere. The origin of most of the photos were attributed to postings on flickr, except for Corky’s photo of the snow piled high in the parking lot of Store 1 in North Portland. Again, under the photo, it was noted that the image came from my Facebook page, “Growing Up With G.I. Joe’s.” I guess whoever copied it, did not realize or else did not care that it was someone else’s intellectual property! So, I would love to share more old images with you, but will wait for the publishing of the book to do so. 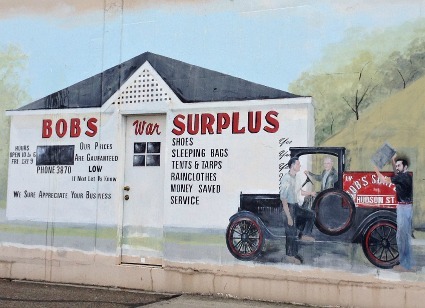 In the meantime, above is a photo of a mural tribute to Bob’s Surplus on the wall of Bob’s Sporting Goods in Longview. I took it in October 2013, when Corky and I dropped by the store to visit with founder Bob Schlecht, Sr.; Bobby Schlecht, and Matt Schlecht. Check out the store on Facebook or online…it was a lot of fun to shop there!